Master of the shock reaction Katie Price has done what she does best, and given her Instagram followers much more than they bargained for – a gruesome picture of a dead bird. Eek! The occasional Loose Women panellist posted a picture of a deceased feathered friend to her Instagram account on the weekend – but soon rethought her post and deleted it, after plenty of comments slammed the ‘cruel’ photo. More: Katie Price and Kieran Hayler – is their marriage all for the cameras? 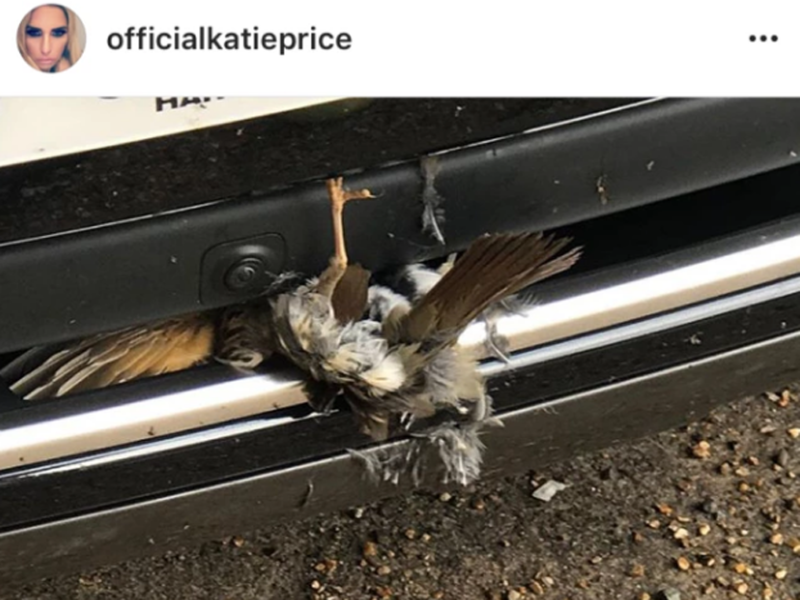 A frequent user of social media, Katie thought it a good idea to share her discovery of a bird trapped in the bumper of her car over the weekend with her 1.3million followers. ‘I must of hit a bird!’ [sic] read the caption underneath the pic, followed by some ‘monkey-covering-eyes’ emojis. Unsurprisingly, the picture was far from a universal success – and it quickly gained a lot of attention from disappointed and ‘disgusted’ fans, who were vocal in expressing their horror at the picture. After tons of highly-negative comments, Katie realised her error and the picture soon vanished from her account without a trace. Far from the first time that the mother-of-five has caused a stir with her Insta-antics, this misjudged photo follows controversy of her letting her pre-teen children Junior and Princess Andre join the site in August, as well as applying facial editing effects on her pictures with them. And at the start of October, she shared a strangely intimate moment with her dog on the app… so we’re guessing it’s only a matter of time before she posts something else surprising very soon!